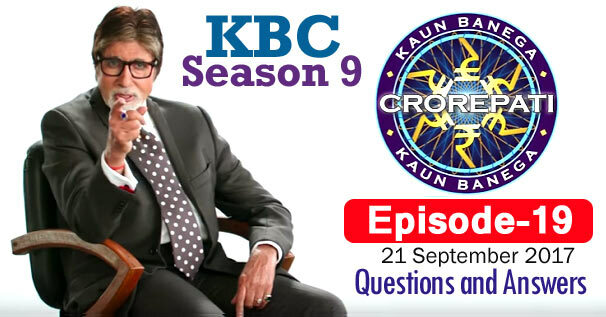 KBC Season 9 Episode 19 Questions and Answers: The nineteen episode of Season 9 of Kaun Banega Crorepati (KBC) was telecast on 21st September 2017. In which Amitabh Bachchan had asked contestants 18 questions of General Knowledge. The correct answer to all the questions is given below each question. By reading these questions, you can prepare yourself for the next KBC Season 10 of Kaun Banega Crorepati. Because by reading these questions, you will understand what kind of questions asks Amitabh Bachchan in KBC. These all general knowledge questions will be helpful to for you various Competitive Examinations and Interviews besides KBC. Remember, the answer to some question may be in accordance with that time, while the answer to those question may differ according to the present time. 1. Which among these festivals usually comes after 8 days of 'Rakshbandhan' ? 3. Identify the leader from this voice ? 4. The airport of which Indian city is named after Raja Bhoj of the Parmara dynasty ? 5. Which of these government programme is aimed at immunitizing children and pregnant woman against preventable diseases ? 6. Which one of these is an avatar of Lord Vishnu who once lifted the Earth with his tusk ? 7. Which is the name of Indian Navy's aircraft carrier which was decommissioned after 30 years of service in March 2017 ? 8. Which of these fruits gets its English name from an Arabic word which can be translated as 'dates' from India' ? 9. which country did Narendra Modi visit on his first-ever foreign your as prime minister? 10. In 2017, Captain Anny Divya Became the world's youngest women commander to fly which aircraft? 12. Which of these movies does not contain the name of any food ingredient in its title? 13. Which of these idioms means to cause trouble or bother?